Biobased & Synthetic Polyamides Market size was over 30 billion in 2017, with projected gains close to 5% CAGR between 2018 and 2025. Escalations in demand for: 3D printing, innovative packaging techniques and bioplastics will be the most prominent trends driving the market size in the near future. Polyamide has been proved reliable for 3D printing for being a strong, flexible and durable plastic material. Biobased & synthetic polyamides are projected to observe surge in demand from the sectors including: in transportation, textiles, energy and healthcare, on account of their high durability and strength by 2025. The sectors will have significant demand for product as a coating material in printed circuit boards, body parts of modern aircraft, aerospace composite structures, for glass reinforced pipes, etc. Medical device designers have been shifting away from metal and towards plastic as their material of choice particularly for 3D printing applications. These include: prosthetic body parts, orthopedic devices, casing of an open MRI machines etc., which in turn propel the market growth over the forecast period. Global bioplastics production capacity was about 2 million tons in 2017 and market for bioplastics is expected to grow by about 20% by 2025. The evolution to a circular and low-carbon economy, an augmented consumer awareness towards sustainable packaging and strong policy support for the bio-economy will be the key factors driving the bioplastics demand. The trend will in turn feature robust potential for biobased polyamides market by 2025. However, higher costs associated with biobased & synthetic polyamides might hamper the market growth to some extent in the immediate future. The global polyamides manufacturers have been aiming the markets with high demands concerning mechanical performance, for instance, technical plastics for the electronics and automotive industries, as well as technical fabrics, monofilaments, food packaging, functional clothing, etc. Polyamide 6 and Polyamide 66 together contributed over 80% market share in 2017 and will observe stable rise in the coming years. Biobased polyamides including Polyamide 10 and Polyamide 11 will observe robust growth at a CAGR surpassing 10% over the forecast period. An increasing number of industry participants substituting the fossil-based by bio-based materials and offering the biodegradable alternatives for their products in response to an enhanced consumer demand for sustainable products will drive global biobased & synthetic polyamides market size by 2025. The aramids segment will also observe significant escalations with their unique characteristics including: rigid and exceptionally oriented molecular structure, ultra-high strength, low flammability, light-weight, abrasion resistance, etc. The segment is estimated to grow with a CAGR surpassing 8% by 2025. The technological progression dedicated to designing improvised personal protection textiles and lessening the soldiers’ load will drive the demand for soft body armor by 2025. This trend will in turn support the aramids demand thereby driving the overall biobased & synthetic polyamides market size by 2025. Transportation segment including automotive, aerospace, marine, led the global biobased & synthetic polyamides market in 2017, with a market share exceeding 30%. Polyamides find a vast range of applications in this segment. In the automobile sector, these have been used to prepare gasoline and oil resistant tubes, fuel lines, air brake systems, engine covers, etc. Polyamides serve as lightweight materials for the metal replacement in the transportation sector and the overall vehicular weight reduction is thus achieved. For instance, Rilsan HT by Arkema have been a substantial high-temperature polyamide to replace metal in automotive tubing. Asia Pacific held the highest share above 40% in global biobased & synthetic polyamides market in 2017. The region is expected to follow a similar trend over the forecast period. The massive share over 50% in the region was contributed by China in 2017, for the vast availability raw materials and production capacities. 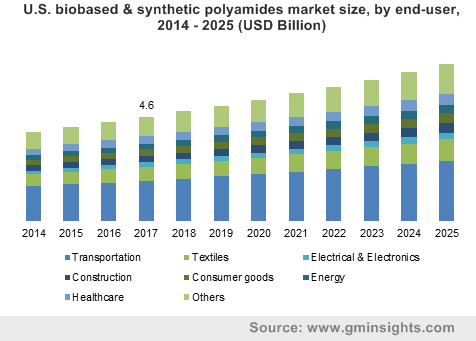 Robust industrialization, cost-effective manufacturing and the immense growth trends exhibited by the regional transportation, consumer goods, electrical & electronics and construction sectors will feature significant potential for biobased & synthetic polyamides market by 2025. For instance, Asia Pacific automobile industry had the highest share in global automobile sale, with India, China, Australia, South Korea, Japan, Malaysia and Indonesia accounting for more than 43 million units in 2017. Indian automobile sector observed strong growth post 2010, with automobile sales exceeding 4 million in 2017. Over 5.7 million vehicular sales were reported by China in 2005, which increased to 29 million (close to 30% of global automobile sales) vehicles by 2017. Such trends exhibit substantial potential for regional polyamides industry in the near future. 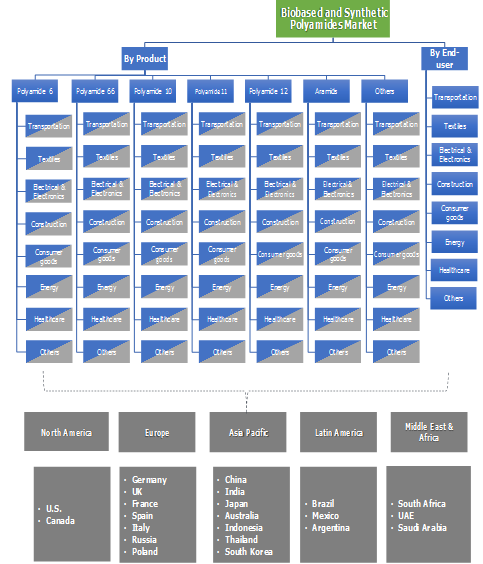 Significant market players include: Arkema, DSM, BASF SE, Evonik, UBE INDUSTRIES, LTD., Asahi Kasei Corporation, DowDuPont Inc., Grupa Azoty, EMS-CHEMIE HOLDING AG, Lanxess, RTP Company, etc. Global biobased & synthetic polyamides market was highly price competitive in 2017 with moderate traits of backward integration. Manufacturers have been engaged in several expansion projects, for instance, in February 2018, Evonik commenced a new production line for polyamide 12 at its production site in Germany, which involves high-performance polyamide powders for 3D printing industry. A polyamide is a macromolecule with repeating units linked by amide bonds. Polyamide 6 and Polyamide 66, more commonly known as Nylon 6 and Nylon 66 have been the most prominent variants of polyamides available commercially. Considering the biobased polyamides, Polyamide 10 and Polyamide 11 have been the most significant variants. These are derived from sebacic acid, which in turn is a castor oil derivative. Castor oil has been one of the most versatile natural products in the bioplastics industry. Biobased polyamides will contribute significantly to the global biobased & synthetic polyamides market growth in the near future.